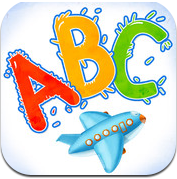 This app is an exciting tool to help kids learn the ABC’s. Song and Rhyming has long been an effective aid in education. Kids love to single and giggle – ‘Kids’ of all ages. ABC Riddles is presented to us by 4iKids. ABC Riddles has what it takes to keep creating giggles the whole while kids are learning. It has two segments, the Alphabet, and the Riddles. The riddles help to reinforce the lesson, with smiles and repetition. The letter used in context, especially silly context, helps to train our little brains 🙂 My daughter was an early reader before all of this tech – eventually reading at the age of 4! Words in context are a nice introduction for a curious young mind, as are letters. My grandson now has these wonderful tools – at four years old he has had them for two years and the tools just keep getting better! The link in the app is for the free version. We chose to and recommend getting the paid version and providing an enjoyable ‘button free’ session for your kids on their devices. Preschool and Elementary Teachers! : This is a great app for your entire class to use in groups or for a special reward free time to reinforce their lessons! Big, Bold, and Colorful ABC’s! Switch Back To Check on Your ABC’s! Meet The Developer! ( It’s in the works! Global Time Delays :-)!